Frasco Mirrors Folding Stand Double Sided Mirror, Brass, 1 lb. 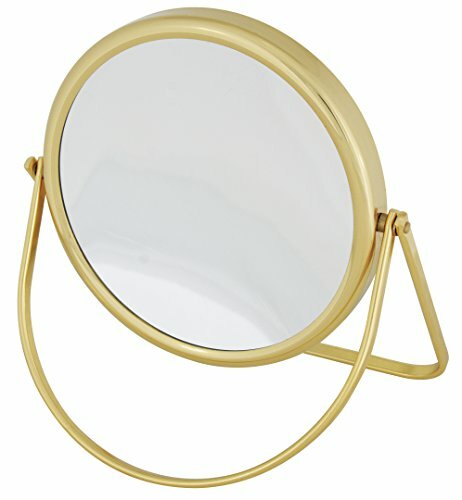 This classicly designed and high quality Frasco 5.25" Round Stand Folding Hand & Travel Double Sided Mirror with Pouch Brass is handmade in Germany from solid, premium-grade brass that has been coated with several layers of clear zapon varnish to protect its surface. Frasco is the premier manufacturer of purse, hand, vanity and wall mounted magnifying mirrors in Europe. Each mirror undergoes rigorous quality control to ensure premium quality in the manufacturing process. If you have any questions about this product by Frasco Mirrors, contact us by completing and submitting the form below. If you are looking for a specif part number, please include it with your message.